First and foremost splurge on winter clothing. Take what you are used to spending on winter clothes and double it. If you consider that the average cost of a car is $600 to $900 a month, and you are replacing your car, it’s totally worth it to spend a few hundred dollars on a good coat, boots, gloves and rain pants that will last many seasons. I’m planning to open an electric and cargo bike store next spring (Boxy Bikes) so I’ve researched the best apparel vendors for utility biking. Showers Pass in Oregon has both thoughtful design and utilitarian values that I like. However, don’t wear warm clothing. You probably don’t want to bike in a ski outfit. When biking, your core body temperature remains high because you are exercising. (In fact, I’ve sometimes turned off my bike’s electric motor in order to pedal harder and warm up!) A windproof shell with good venting is more important than thick insulation. 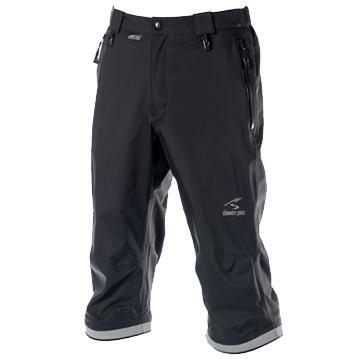 And thin waterproof rain pants are more useful than padded ski pants. Even better are bike pants that can be vented or that can be converted to knickers. I know you might be thinking “I wouldn’t be caught dead wearing knickers!” Knickers solve a frustrating problem with rain pants. If you wear rain pants in a storm, you’ll find that no matter how “breathable” they are your legs get wet from sweating. And if you don’t wear rain paints, they get wet from the rain. However, experience bikers know that rain in a storm falls mainly on the thighs, which are facing upwards. Knickers are the best solution in rainy weather because they cover your thighs but leave your calves to breath. The coldest part of your body will be your hands, since you are required to keep at least one of them on the handlebars at all times. Consider getting electrically heated gloves such as motorcyclists and skiers wear. The only other ski equipment you might want is a pair of goggles for riding in snow flurries. You may only use them once or twice a season, but when you do they are worth it. Once you’ve taken care of your own body, consider the needs of your bicycle. The biggest challenge to winter riding is staying upright on ice, which may appear beneath your wheels when you least expect it. Pardon the all caps, but IF YOU RIDE IN THE WINTER YOU MUST PUT STUDDED TIRES ON YOUR BIKE. They may only save your life once or twice a season, but surely that is enough. You will have better traction than cars. Note that the purpose of the studs is not to help with snow riding, but to help with street riding on streets that may have a film of ice on them. You might think you can simply see where the ice is and avoid it, or not go out when it’s icy. Unfortunately there are situations where there may be ice under a layer of slush, or a street will be ice free in sunny areas but dangerously icy in shady areas. Studded tires are noisy and don’t roll as efficiently as regular tires, so here in New York it’s a good idea to switch to regular tires from April to November, and use the studded tires from December to March. Note that you need studded tires on both your front and rear wheels. Again, as a shop owner I’ve determined that the best studded tires are made by Schwalbe and Nokkian. You can read a lot more about studded snow tires here. Your batteries are the most expensive part of your bike, so it’s worthwhile to take care of them. When the weather gets below freezing, if you haven’t done so already set up your charger inside. Temperatures around the freezing point won’t damage your battery, but batteries will be reduced to about 80% of their power and range, so plan ahead. Batteries can only be damaged by sub-zero temperatures (less than 0 degrees fahrenheit or -17 celsius). Batteries with different chemistries have different temperature ranges, so check your battery’s spec sheet. Your bike will suffer in the winter, especially from road salt. Road salt corrodes aluminum and accelerates rust. There’s nothing you can do. You can try cleaning it off, as non-utility bikers will recommend. But if you keep your bike in an unheated garage or on the street that might not be an option. And as a utility biker you want to spend time using your bike, not cleaning it. A better strategy is to use one bike in winter that you don’t mind getting trashed, and use another finer machine the rest of the year. You only need to keep a few critical moving parts working. The bike parts most affected by salt will be the chain and the derailleurs. You can keep a chain alive through the winter by regularly oiling it with very thick oil such as Phil’s Tenacious Oil. Then simply replace it in the spring. This is a lot easier then trying to clean it. And my advice for the derailleurs: get rid of them. You probably don’t need them. If you ride an electric bike you have probably discovered that you only use the top gear of your bicycle. Your bike may have 24 or even 27 gears but you only use one. That’s because the most natural way to ride an electric bike is to use the motor to accelerate to top speed, then pedal in the highest gear of the bike to maintain that speed. It is easy to disable the rear derailleur by removing the cable and using the limit screws to position the derailleur over one cog. Similarly remove the front derailleur cable and cage and then manually place the chain on the chainring of your choice. You’ll find this eliminates a lot of winter riding headaches. When you are out and about on you bike this winter you will find many occasions that make you glad you’re on a bike. You will awake to the sound of a neighbor’s car spinning its wheels, unable to get out of an icy spot. You will realize you haven’t needed to shovel your driveway this winter. You will pass a group of people shivering at a bus stop and notice that you, in contrast, are pleasantly warm from mild exertion. You will pass cars that have slid into the ditch and were abandoned, and you will think how lucky you are to be on a bike. You will find yourself on a country road on a moonlit night in fresh fallen snow, and you will experience the deepest silence you have ever known. Previous Previous post: The FlyKly Smart Wheel: Too Good to Be True? Next Next post: Electric Cargo Bikes Have Car-Like Utility but Bicycle-Like Costs: Cool!